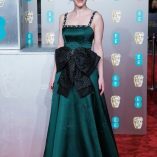 Rachel Brosnahan images and pictures from the 2019 BAFTA Film Awards. 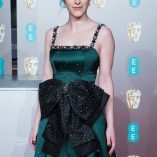 The American actress appears in a dark green satin gown. Rachel wears silk and satin at Grosvenor House on the 10th February 2019.